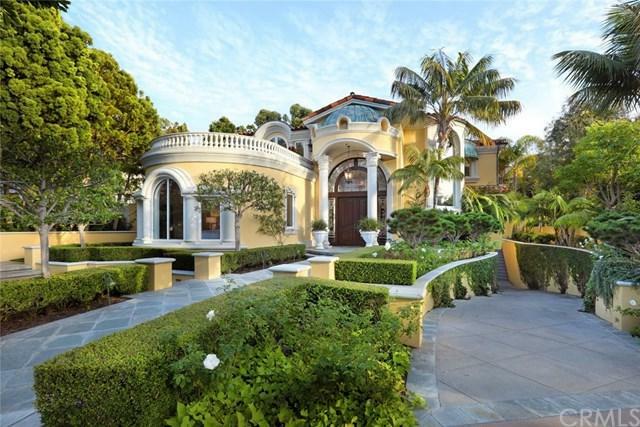 This custom built home in the exclusive guard gated community of Pelican Point features stunning ocean and Pelican Hill Golf Course views. 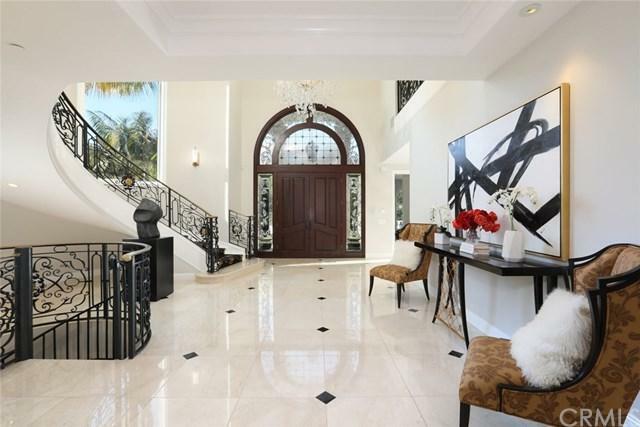 Enter through a grand foyer with crystal chandelier and sweeping spiral staircase lit with crystal sconces to the ground floor living area. Uniquely designed, this home features all five sizeable bedrooms suites on the ground floor. French doors open to the elegant master suite featuring fireplace and retreat with large windows to the panoramic views filling the room with natural light. The opulent master bath of marble and custom fixtures features a large adjoining walk-in-closet. Completing the ground floor is a wood-paneled office/library. On the second level, the living room, family room, dining room, and kitchen seamlessly flow together and are designed for indoor-outdoor living with multiple terraces and spiral staircase to a private, rooftop terrace. The chef's kitchen features a breakfast nook, stone counters and wine refrigerator. The lower level bonus room features built-in cabinetry and storage. The rear yard epitomizes the California lifestyle with pool and spa, fire pit, and built-in BBQ overlooking the golf course and ocean views. A 7-car subterranean garage completes this exemplary residence.